MIAMI COUNTY —The holiday season is bittersweet for those who Miami County Victim Witness serves throughout the year. 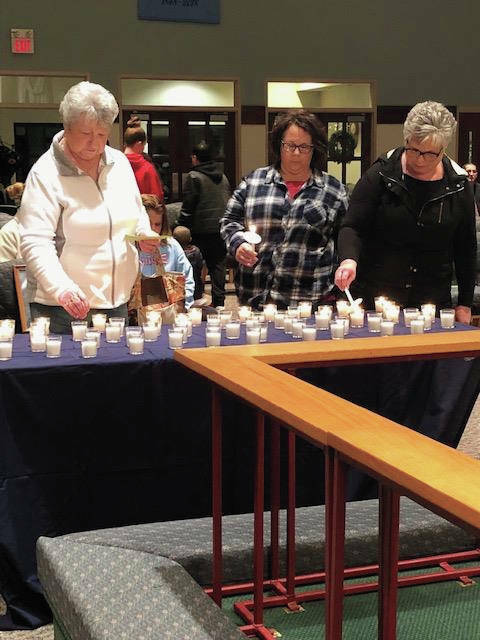 The organization held its annual candlelight ceremony in honor of those who were lost and are served through the Miami County Prosecutor’s Office and local law enforcement on Monday at the First Lutheran Church in Troy. Miami County Prosecutor Tony Kendell said the annual service holds a special place in their hearts. “It’s that time of year again for family and friends to gather together and celebrate. For those that have lost loved ones by the criminal act of another or through addiction, illness, car wreck, it can be very difficult indeed. I can’t speak to this pain and hardship you feel at times like this,” Kendell said. Lt. Joe Gephart of the Piqua Post of the Ohio State Highway Patrol shared his story of those who are tasked with providing death notifications to families impacted by sudden loss through traffic accidents and other tragedies. Gephart shared how they are thankful for Miami County Victim Witness advocates who assist in death notifications so they don’t have to do it alone. Gephart said while troopers are trained on how to investigate crash scenes, arrest offenders and other tasks, learning how to break the news of the loss of a loved one isn’t part of their training and troopers have to learn it how to do it on their own. Families lit candles in their loved ones’ memories. Miami County Commissioner and FOP Lodge Chaplin Greg Simmons opened and closed the ceremony with prayer. Del Braund provided “Amazing Grace” on the bagpipes at the end of the ceremony.